Google Photos has reached an impressive milestone in less than half a year after breaking away from Google+, announcing today that it has reached 100 million active monthly users. Available on iOS, Android and web, Google Photos launched as a standalone unlimited photo service back in late May, with the search giant officially switching off its older photo service Google+ Photos - which was a part of the companies social network Google+ - a few months later in August. Reaching the 100 million user milestone is very impressive, and the user boost is not surprising as Google Photos allows users to sign up without requiring to have a Google+ account, a restriction that was part of the older photo service. Still, despite having the added bonus of migrating an established number of Google+ Photo users, 5 months is still a very short amount of time to reach this milestone. The new standalone app is also a lot more powerful, along with giving users the ability to store an unlimited amount of photos in the cloud of 16MP photos and 1080p video for free, making it a much more attractive photo storage option compared to its competitors, including Apple iCloud. It also includes editing options, the ability to share photos or videos via links rather than through emails, as well as automatic syncing to Google Drive, GIF-like animation creations, and photos automatically grouped by time, people, places and things. 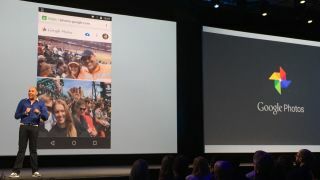 As part of Google Photo's milestone announcement, the company also included some interesting facts, including that the online photo service's auto-upload feature had allowed it to free up 3,720 terabytes of storage on a user's smartphone. Also, cats don't completely own the internet - apparently Google Photo users take more photos of dogs than any other animal.